Joining with the lovely ladies of Fine Linen and Purple. As I was sitting in Mass on Sunday (with a very wiggly Maria) it occurred to me that some of my view of taking babies to Mass has changed. Not too long ago, I co-wrote a book (along with the lovely Amy of Go Forth and Mother) on raising babies and toddlers in the faith, and I still stand by the advice I gave in that book. However, I think that, in some ways, Maria has caused me to go back to the basics. 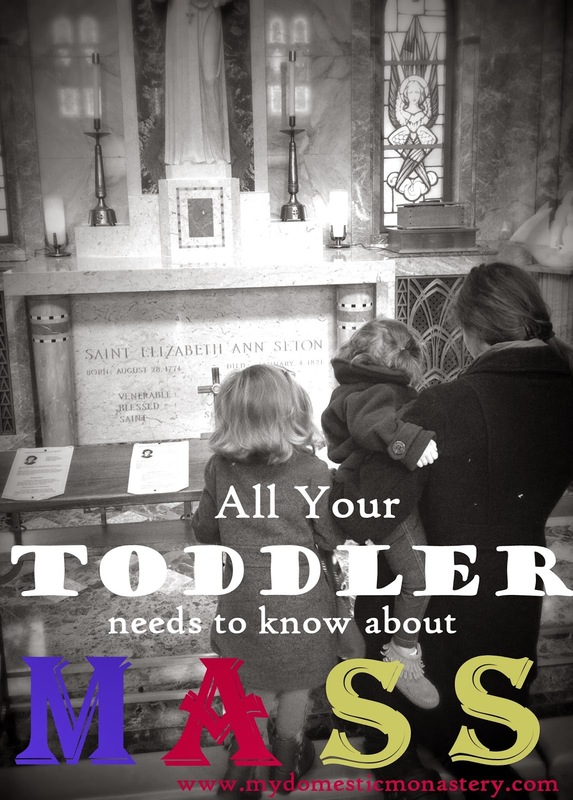 So today, I'm going to share with you the one big thing worth teaching your toddler or baby about Mass. That's it. That's the one big thing that you need to teach them - that Jesus is present. You can teach them this whether they are at Mass or not, but it is easiest to teach them if you take them to Mass or adoration at least sometimes. Why is that? Because Jesus Himself will teach them. I'd like to share with you a little story, about a friend of mine, whose name is Philip. (Changed, of course, for privacy reasons.) I think I've shared with you before how I previously worked with children and adults with special needs, and still continue doing some of this work through the National Catholic Partnership on Disability. Part of the ministry work I did one summer in college was running Sacrament preparation for some of the residents of a facility for those with very severe disabilities. My friend Philip was in his late teens, needed to use a wheelchair full time, and had a severe mental disability (that probably had his mental functioning around that of a one year old or so). I absolutely loved him. He was full of life, and he loved to make people laugh. My job was to prepare Philip for First Communion and Confirmation. I taught him what he needed to know, telling him stories, and showing him pictures, and making sure to accessibly teach him the high points of the doctrine (the stories of the Last Supper and Pentecost, for example). But I also did one key thing - I held our classes in the chapel in his residence, in the presence of Jesus in the tabernacle. Every class, we would start by going over by the tabernacle, and saying a prayer together. I would point to the tabernacle and tell Philip that Jesus was inside, and that He loved Philip very much. The day came of Philip's First Communion and Confirmation, and I was nervous about how it would go. I had helped Philip practice receiving an unconsecrated host particle (so he would be familiar with the taste and texture) and he made it clear that he was fairly disgusted by the experience. However, when Philip received a consecrated host - when he received Jesus - his reaction was very different. This young man initially looked confused and then - suddenly and inexplicably - began to smile. He smiled bigger than I had every seen him smile. I can't say for certain, but I think he smiled because he encountered Christ. 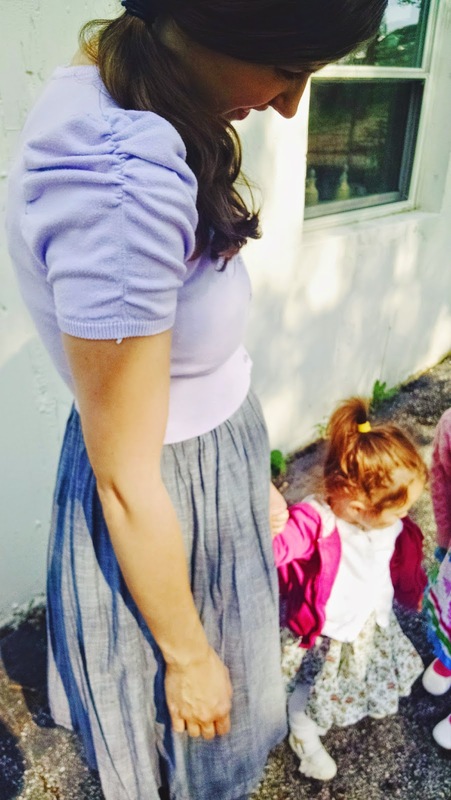 This memory stuck with me, and the lesson that Philip taught me, I apply to my own children. I have a bachelor's and a master's degree in theology. I've taken entire classes on the theology of the Mass and the Eucharist. But what I've learned is this - all the theology in the world only matter if you love Christ. There is a real importance and value to understanding the theology behind the Mass and the Eucharist. But you can't fully understand and appreciate that theology if you don't first have a love for God, and know of His deep and abiding love for you. There is an old saying in Catholic theology, "Lex orandi, lex credendi." Simply translated it is something along the lines of, "Rule of worship/prayer, rule of faith." What it means is that how we pray and worship is directly connected to what we believe, and that much of what we know about what we believe is tied in to how we pray. So what does this mean for your toddler? It means that if you teach them to pray a very simple prayer, then they will learn volumes about the Eucharist. All you need to teach them to pray is (and really it consists of you saying the prayer for them, when they're small), "I love you, Jesus!" In addition to that, whenever you're able to bring them to Mass or adoration, don't be afraid to do so. You know your child best, and if there's a stretch when you need to leave your child at home - don't sweat it! But whenever given the opportunity, repeat this simple lesson to them. When you enter the church, point to the tabernacle and whisper, "Jesus is in there. He loves you very much. We love you, Jesus!" or something along those lines. If you feel comfortable doing so, maybe even teach them to blow Jesus a kiss, or at least to give Jesus a little wave. You can do that during the moment of consecration, too (especially if your church uses bells at the consecration...the bells get Maria's attention every time!). But don't stress if you can't do it every time, and don't stress if your baby or toddler doesn't come with you to Mass every week (i.e. if there are some weeks that you just need to go alone or bring just the big kids). Just do your best. Just let them know that you love Jesus, and that you make that your own prayer. The more they experience that (even when you pray together at home) the more they'll understand what's important about Mass. 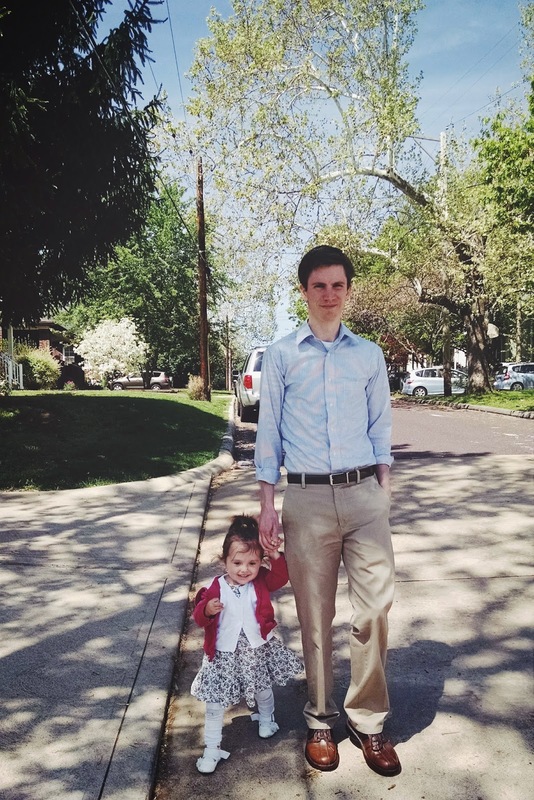 We do discipline our girls to behave a certain way during Mass, and there are consequence for misbehavior (no playground after Mass, or no donuts, or Daddy has to carry you to the back of church for a time-out). But the way I see it, learning to be reverent at Mass is much like teaching them to behave anywhere. It is important for them to learn. And it will help them pray better in the future. But I don't discipline them if they don't say, blow Jesus a kiss, or look up during the consecration. Right now, when they are little, I mainly just want them to know that Mass is a place where they are loved, and where they can come to know God's love. The rest will come in time. 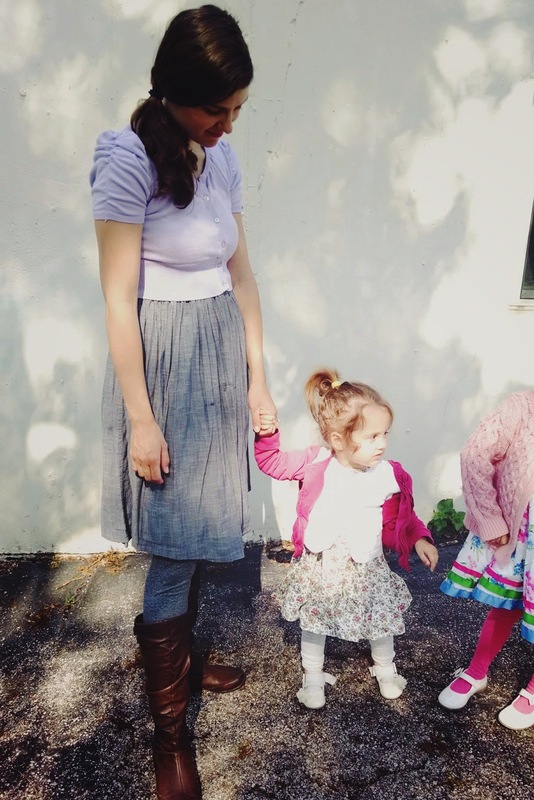 As I see it, personally, any discipline that happens at Mass is a part of my overall goal of teaching my toddler to behave like a normal person in public. Learning to be reverent will come in time. Bottom line - don't stress it! And if you like this advice, adapt it for however it works in your family and with your own personal style of devotion. This will look different for every family! Pre-order information for the book coming soon! I'll let you know as soon as it's available!! !